"SONAR - State-of-the-art digital audio workstation"
If you’re looking for a full-featured digital audio workstation or DAW, Cakewalk SONAR should be on your shortlist. Hence, if you’re actively involved in the music production field yet, or plan to be, consider reading on and start discovering more about the features and the wide range of functionality provided by this product that matured over the last 25 years, from the early days of using computers for making music, and nowadays suitable for anyone who wants to work with a state-of-the-art digital audio workstation. SONAR is Cakewalk’s best known professional product, their flagship DAW being called SONAR X3 Producer, a music sequencer annex digital audio workstation incorporating MIDI and audio multi-track recording annex editing functionality. It’s a project-based solution for efficiently working with raw audio tracks, MIDI files, lyrics and other related information, allowing the user to have it presented in several ways, such as an event list, an editing console and even musical scores. Of course it will allow you to create mixdowns into the stereo WAV audio file format, for example to burn audio CDs, as well as various other audio file formats. What follows is a more exhaustive feature-list of SONAR X3 which is available in several versions. All versions feature the dedicated Skylight user interface, unlimited audio, MIDI, effects and sends, a 64-bit engine, support for multi-touch, Virtual Studio Technology 3 (VST3) audio plugins, a step sequencer, matrix and staff view, PRV and Video support, integrated social network sharing for Soundcloud, YouTube, Twitter, Facebook and Gobbler, the virtual drummer called Session Drummer 3, the Overloud TH2 SONAR guitar amp simulator, among others. The SONAR X3 Studio and Producer versions also feature Rapture and Dimension Pro, Melodyne Essential pitch correction, additional effects including mastering plugins and the SONAR X3 Producer version gives you the full version of XLN Audio Addictive Drums, support for a total of nearly two dozens of virtual instruments, 57 effects and 8 ProChannel modules. 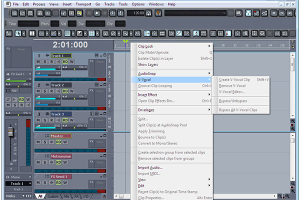 SONAR is a renown product released by Cakewalk, a specialist in music production software. SONAR is state-of-the-art software for electronic or digital audio and music recording, editing and producing. This DAW is the result of a parallel evolution in computer power and technological advances in both audio equipment, software and hardware. Cakewalk started in 1987 and in 2008 Roland, the important Japanese player on the electronic music instruments, equipment and software, purchased the majority of shares of the company behind SONAR, resulting in the next-generation SONAR V-Studio line. At the end of 2013 Roland sold their shares to Gibson Brands, yes the company behind the famous guitars, and at the time of writing encompasses also TEAC, Onkyo, and the pro audio Stanton and TASCAM, What started as a MIDI sequencer for DOS evolved to the mature DAW we offer you here as a free download.